Napoli reduced Juventus' lead at the top of Serie A to six points thanks to a 2-1 win at home over ten-man Lazio. Goals from Jose Callejon and Arkadiusz Milik looked to have guided Napoli to victory before Naples native Ciro Immobile pulled a goal back for Lazio, but the visitors could not draw level after they were reduced to ten men following Francesco Acerbi's red card. The game got off to a flying start as Alex Meret was called into action early on, producing a fine save to deny Sergej Milinkovic-Savic's header before Milik rattled the crossbar with a fearsome left-footed effort. The hosts were inches away from taking the lead midway through the first half, but Milik's shot was somehow turned onto the post by the fingertips of Lazio goalkeeper Thomas Strakosha. Callejon did put Napoli in front, ending a personal goal drought of 1,235 minutes when he fired home into the bottom right hand corner from Dries Mertens' pass. 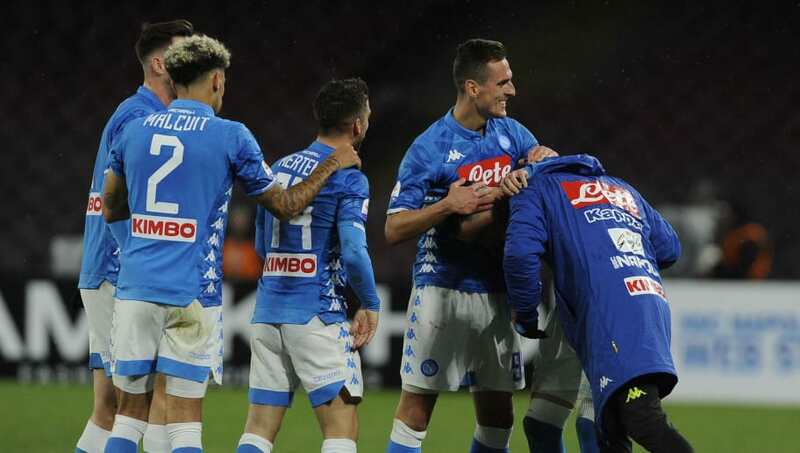 Napoli doubled their advantage only four minutes later, after Milik curled a sumptuous free-kick into the top corner from 25 yards for his eight goal in his last eight appearances. Ciro Immobile cut the home side's lead in half when he exquisitely curled a right-footed effort beyond Alex Meret to bring Lazio back into the contest for a brief period. The Blancocelesti's chances of finding an equaliser were dealt a severe blow after Acerbi was shown a red card for a late challenge on Jose Callejon. Acerbi's sending off, in his 149th consecutive Serie A game, means that he will not break Inter legend Javier Zanetti's record of 162 straight appearances in the competition. Despite table-topping ​Juventus being undefeated in the Serie A so far this season, an important win for Napoli meant they closed the gap to the Bianconeri - who host Chievo on Monday - to six points. It was not a vintage performance from Carlo Ancelotti's side, and Lazio were somewhat unfortunate to be 2-0 down at half-time, the scoreline an unfair reflection of what was an even contest. However, Napoli deserve credit for their ability to take their chances, thanks to some clinical first-half finishing. A lengthy list of absentees that saw them without Kalidou Koulibaly, Allan or skipper Marek Hamsik was not a cause for concern thanks to an excellent team performance from Gli Azzurri. Napoli 2-0 up vs. Lazio at half-time without any of Koulibaly, Allan, Hamsik, or Insigne is quite something. Starting XI: Meret (7); Malcuit (7), Albiol (8), Maksimovic (5), Mario Rui (7); Callejon (8*), Diawara (6), Zielinski (7), Fabian Ruiz (7); Mertens (7), Milik (8). Substitutes: Ounas (6), Hysaj (6). Jose Callejon will be relieved to have ended a goal drought that stretched back to the end of last season with a strike that will undoubtedly boost the Spaniard's confidence. Aside from the personal milestone, Callejon was a constant threat to the Lazio defence with his runs in behind causing all sorts of problems for the visitors until he was withdrawn in the closing moments of the contest. He was unlucky not to add to his goal tally after the interval when he smashed an effort on the half-volley over the crossbar, but will certainly be satisfied to have scored his first goal of the season. In place of the absent Koulibaly, Maksimovic played a number of risky backpasses when facing towards his own goal that put unnecessary pressure on his teammates. The quality of his first touch was also questionable throughout the game, as it saw him give away possession on a number of occasions when under no real pressure. Following Maksimovic's error-strewn performance, ​Napoli will be glad to have Koulibaly back, after the Senegalese international served a controversial ban for a red card despite being the subject of racist chants by Inter fans on Boxing Day. Napoli will be buoyed by this result before their next fixture, which sees them travel to the San Siro to face AC Milan next Saturday in ​Serie A before the two sides meet again in the quarter-finals of Coppa Italia on Tuesday, 29 January. Lazio return to league action on Sunday as they welcome Juventus to the Stadio Olimpico, with kick-off at 19:30 GMT.